Chapter 2 in the book of Ruth may be my most favorite. We see grace and blessing flow from Boaz’s love. Surely that is the same thing we see from God when we see His manger and the His only begotten son who is born there. In chapter two of Ruth we see Ruth going out to gather grain for food for her and Naomi. God had a law that the poor and widows could go out during the grain harvest and follow behind those who worked in the fields harvesting the grain. If the workers should drop any or leave some on the stalk, they were not allowed to go back to pick it up. They were to leave it so the poor could come behind them and pick it up for their food. So off goes Ruth to follow behind the workers to gather food. Verse 3 says that Ruth, “…happened to come to the part of the field belonging to Boaz…” I point this out because while I am sure that in Ruth’s eyes it seemed like a coincidence, I am also just as sure that it was far from chance or happen stance that she came to Boaz’s field. The reason I say that is because if she had never come to Boaz’s field, he would have never seen her, fallen in love with her, redeemed her, married her and they would have never had a child. Oh, the child. He wasn’t just any child. He was Obed. Who? Obed the father of Jessie. Jessie? Yes, Jessie, the father of David! That’s right, that David. King David the greatest king to reign in Israel. The one through whom the lineage would bring another Son. Another great King. A Child born in a manger to take away the sins of the world. So you still think it was by chance? No, God was working out His plan. His plan to bring salvation to the World. To you and to me. That’s what the baby in the manger is about. It is God working out His plan to bring us salvation. This always helps me to have hope and trust during uncertain times, because I know that God in His providence can guide my life to exactly where He needs it. I can trust that He is in control even when I am unsure. That to me makes for a Merry Christmas. I love how when Boaz comes out to check on the workers he immediately sees Ruth. She must have been beautiful to catch his eye like that. He inquires and finds out who she is. He then tells her to stay always on his fields and work behind his workers. He has given orders to his workers to look out for her protection and to give her water when she is thirsty. In verse 10 she is very grateful. She even asks Boaz why he is being so kind to her. Really, there is no reason. He is falling for her, that’s all. It is grace. It is undeserved. That’s Christmas. That’s the baby in the manger. Born to die. It’s grace. I don’t and never can deserve it. But there He was, born to die, for you, for me. Merry Christmas. Later in the day Boaz invites Ruth to eat lunch with him and his workers. She no doubt has a good meal. When she leaves to go back to work he gives his workers further instructions on how he wants to bless Ruth. He told them that she did not have to follow behind. 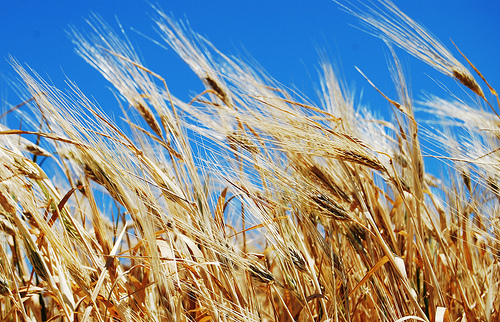 In fact she could come and gather among the sheaves of wheat before they are picked up. In verse sixteen he told the workers to intentionally drop some grain so she could pick it up. I just smile when I read this. Boaz just making sure that Ruth is blessed. I think that God treats His children who follow after Him in the same way. He just intentionally drops blessings right in front of us so we can have them. I think it makes Him glad. I am currently doing a study through the prophet Isaiah. In chapter 44 and verse 8 God tells Israel that they are going to be His witnesses of His blessings. Now upon close study I found that God really wasn’t saying that they would go and tell of His blessing, but it was more of their existence and the things He would do in them and among them would be a witness to the world. God wants to bless His church as witness to the World. He wants to show the world of His love and kindness. See Ephesians 2:4-7. So, the story of Boaz, Ruth and a baby in Bethlehem are a story that show us God’s providence, grace and blessing. I think the Christmas story of Joseph, Mary and the Son born in the manger is also a story of God’s providence, grace, and blessing. This entry was posted in Book of ruth, Christmas, Random thoughts, Uncategorized and tagged book of ruth. Bookmark the permalink. What stands out to me in Ruth ch 2 is Ruth’s humility. Her humility comes before her honor. But it seems so pure and real. Genuine humility. She wasn’t expecting favors. She was willing to humble herself. Ruth readily worked to provide for her and her mother-in-law. She planned on working. Providence led her to the place where blessings abounded. But, first it seemed her heart was yielded and pliable. In our arrogance, we often expect favors. We quietly demand service and blessings. Then we call it grace or mercy when we receive. It’s mercy that keeps our lofty-minded selves from being struck by lightning! Do we see this servitude in our young people today? An expectancy to actually work for food? And then to provide for parents with what they earn? Oh, the freshness of a precious, humble heart like Ruth. That’s what I pray to have. Revive my heart, Oh Lord.